Since June of 2014, the effort to stop a condo development at 16th and Mission Streets has been on my radar and it's time to assess the lead organization attempting to halt the project. 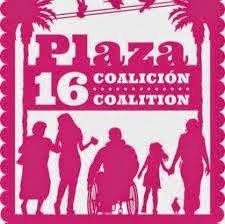 The Plaza 16 Coalition touts itself as a community-based and community-led organization, but after several intense weeks of seeing how aloof and opaque the steering committee is and attending their March 18 meeting, I know the grip of Mission and Latino nonprofits is strangling genuine democracy and transparency for the group. Let's go over some key deficits. The steering committee is stacked with a majority of nonprofit community organizers who have been PC-processed to death and lacks a basic plan to simply keeping tabs on the developer Maximus Partners. Folks monitoring Planning Commission meetings and reports, or mobilizing folks to use public comment at those meetings? No. The March 18 steering committee meeting was the first time Plaza 16 had any assessment of its action two-weeks prior disrupting Maximus' community meeting. With disfigurement of the Mission marching on every day and no curbing of developers' hunger, it's shameful it took two-weeks (two-months equivalent in the web-age) to hold a followup gathering. Build on the energy of the March 4 disruption? That would require advance thinking, something sorely lacking. No general membership followup or steering committee meeting, no plans to picket the Mayor's ribbon cutting on March 5 at the homeless navigation center opposite the site of the Maximus condos (where dozens of electeds and people with power over planning and the media were in attendance), no clues of what to do after March 4. What were some of the items on the committee's agenda last week? Potentially endorsing a request from Sup. Jane Kim about the Planning Commission's analysis of Prop K, the symbolic policy statement passed by voters in November wishing for more affordable housing. There was nothing in writing laying out precisely what the supervisor was pushing and even there had been it would have been one more thing to divert the committee's attention away from the dearth of a guiding agenda for Plaza 16. Let Kim fight her own battles at the commission and City Hall and get Plaza 16 to develop and focus on its own agenda free of influence from electeds. A central figure in Plaza 16 is Oakland resident Maria Zamudio of Causa Justa, a truly inept organizer. During the steering meeting, as we discussed moving these meetings and those of the dysfunctional work groups from Wednesdays at noon to early evening hours, she again showed her true colors opposing a change because it would mean more folks could attend and organize for change. "It's really hard to have good meetings with 30 or 40 people," Zamudio said. Effective organizers would welcome such high numbers at activists' planning meetings, when taking on a wealthy developer and their myriad buddies at City Hall, because it's going to take a lot of folks to stop or radically change the project. The last thing she and other steering members think of is how to engage more folks to do more monitoring and activism of all sorts because it would mean more scrutiny of their poor leadership and less control for them. It's not rocket science to see there are no minutes or agendas from the past 18 months, since Plaza 16 was formed, on their site. Yes, the administrator Andy Blue shared a report back from the February monthly community meeting, but if you're a Mission resident or business person and want to get up to speed on where the group has been, such info is omitted. No, it's not enough to share photos from fun and powerful action, and quote and highlight only the voices of nonprofit reps, as the primary source of engagement with the general membership and public. Then there's the detriment of Plaza 16's closeness to Sup. David Campos. As far as I can determine, there's not been of peep of protest against him. In his press release before the March 4 forum and then report back, Blue cited Campos' complaining about being misidentified as a co-sponsor. Blue didn't point out that Campos has been spineless on Maximus and gentrification in his district. For the sake of the Mission and 16th Street BART Plaza area, it would a wise step if Plaza 16 folded and a new, truly democratic and transparent organization were to form in its place. The current incarnation of the coalition gives Maximus no reason to fear them.